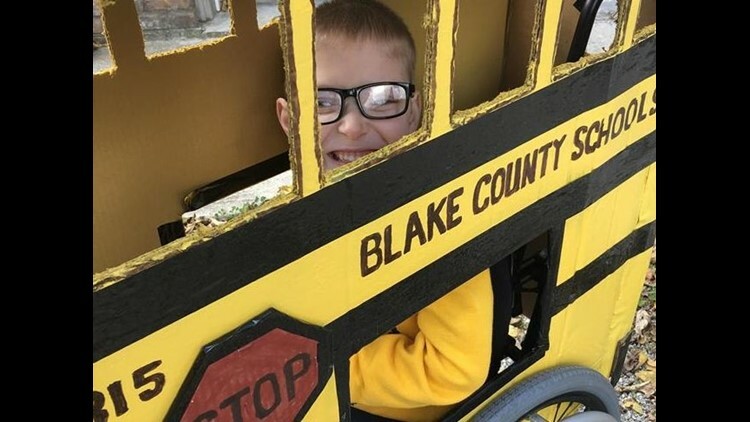 Blake Mompher loves school buses and this Halloween one is his costume fitted over his wheelchair. Blake Mompher, a 5-year-old Ohio boy, loves school buses. 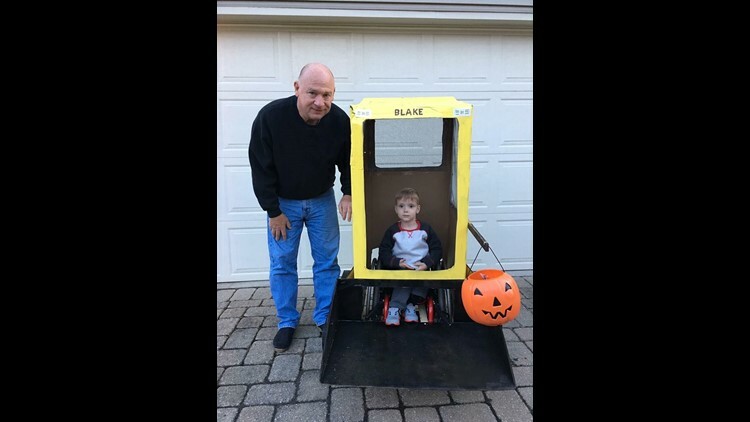 This year, the boy who was born with spina bifida gets to be one for Halloween thanks to his grandfather, Gary Mompher, who built a school bus costume from an old recliner chair box. The bus fits over the boy's wheelchair and sports the name "Blake County Schools" in his honor. 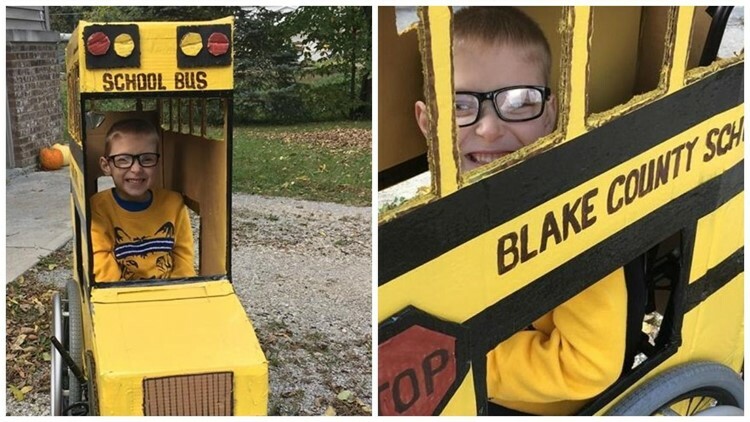 Blake's mother, Megan Mompher, of Prospect, Ohio had been fielding interview requests Monday morning after the post featuring videos and photos of him in the bus costume went viral, stunning her since her Facebook page is private. She told All the Moms that the magic of it all comes from grandpa's craftsmanship and Blake's sheer excitement at his costume. "People see the joy, totally and for sure. We didn't tell him to do a thing. That's just him," Mompher said. "He loves school buses." Maybe he's so enamored with school buses because they are yellow. He has a thing for the color. Or because he sees his older sisters, ages 6 and 8, board the bus on their way to school. Blake's in preschool and will take the bus to kindergarten next year. Mompher said she's happy the video of her son is getting attention because it's given her a chance to talk about spina bifida. "I didn't even know what it was before Blake," she said. Spina bifida is a birth defect that occurs when the spine and spinal cord don't form properly. The severity of spina bifida can vary. Blake was born with myelomeningocele, the most common and severe type of spina bifida, and he will need complex and lifelong care. Last year, she wanted to do a school bus costume for Blake but, like holidays do for moms, Halloween "kind of crept up on me." This year, however, she started combing Pinterest early for ideas on how to build a school bus to fit over a wheelchair. Armed with pictures, she presented them to Blake's paternal grandfather, who'd already made Blake an incredible bulldozer costume in 2016. "Oh, he's amazing," Mompher said. "Last year we just did Mickey Mouse. It was cute, but not as fun as when he was in the bulldozer. That was a hit with people. He was given tons of candy, and people were excited to see that creativity. I can't wait for this year. He's really starting to understand it, and it's going to be more fun." Grandpa spilled yellow paint in Mompher's garage-making of the school bus costume. "And it's totally fine," mom said. Blake will trick or treat with his sisters on Halloween and take the costume to a trunk or treat function, but mom is wary about wearing it to preschool all-day on Halloween. Grandpa's handiwork is topnotch, but it is only cardboard.